Many people are looking to have a positive focus in life, but their confidence is in their own abilities. This is not a "power of positive thinking seminar" like the world has, where people will only say “yes” a million times in life so that they’re oozing with this positive flow from the word “yes.” This is the power of choosing God and His Heaven over the dark forces so that we are given God’s Spirit, which includes joy, peace, and self-control. Learn how to go all the way with these positive thoughts of laying down your overeating, your overdrinking, your anger, and your over-indulgence and greed, and fill up on the Spirit of God! Learn from these two video and two audio lessons the true positive words - the Good News of Jesus Christ - His positive words that we can lay it down, and that God has provided a way for us to obey. 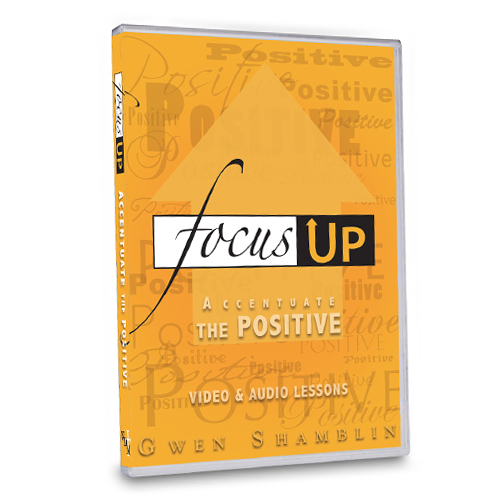 Included are DVD lessons titled "Positive Thinking" and "Flip It" and audio CD lessons titled "How to Focus Positively" and "F.O.C.U.S" All of these lessons were recorded as live presentations at the Remnant Fellowship Church in Nashville, TN.